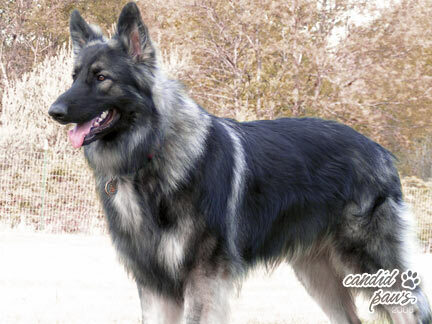 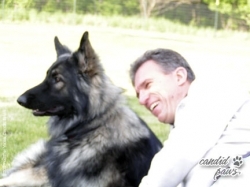 When we did obedience work with GSD’s, I always swore that someday we would have a big, dark shepherd and call him Rommel. Well, here he is — NS brCH G&T’s Desert Fox of Ridgewood, CGC, TT, TD. 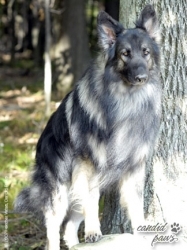 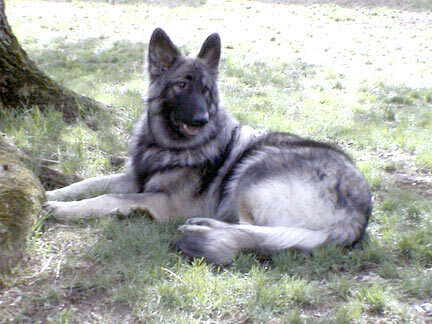 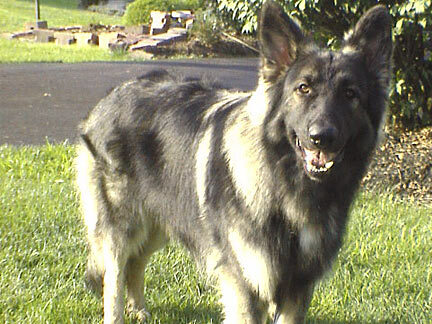 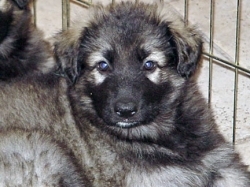 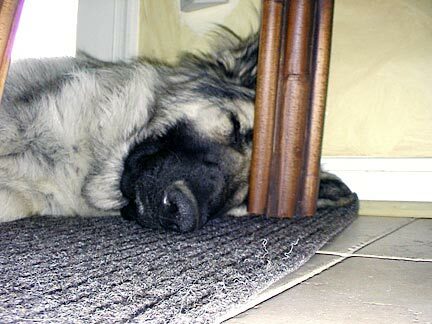 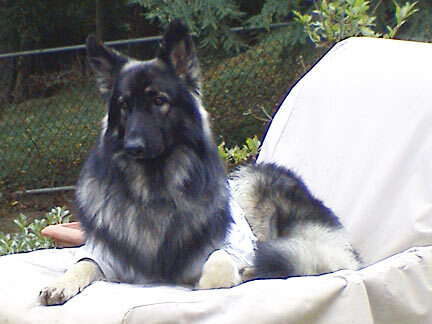 He was suppose to be the female we were still looking to replace, but ended up being one of the 2 top Shiloh Shepherd pick males from the July 2003 Artie/Chewie breeding. 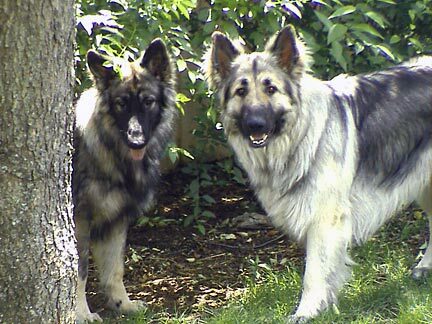 By 10 months, both Bismarck and Caly had pretty much reached full growth. Rom, on the other hand, we were never sure would ever stop growing — he was the ultimate Shiloh Baby Huey. 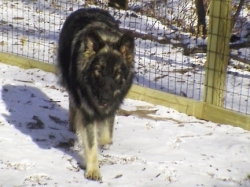 A gray sable, wicketed just short of 30″, big boned, with a huge open plush coat, Rom tends to dominate the area immediately around him. 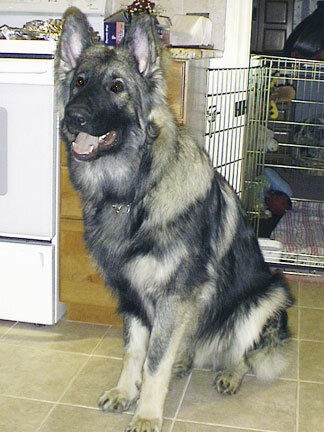 Despite his size, Rom has an incredible, gentle demeanor with both people and other [domesticated] animals. Certified as a Therapy Dog with Bright and Beautiful Therapy Dogs, Inc. he drew rave reviews and complements from both testers and AKC spectators at the conclusion of his certification test for his unshakeable confidence and equanimity in the distraction elements of the test. 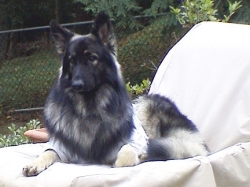 In November 2007, Rommel began to exhibit a pronounced limp. 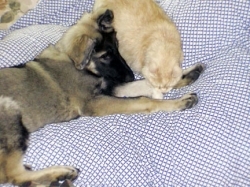 A course of anti-inflamatories and rest did not relieve the condition. 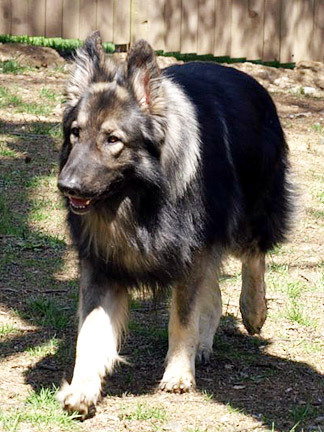 Upon examination by an orthopedic specialist, he was diagnosed with dysplasia in his left elbow and Ununified Aconeal Process (DJD). The right elbow is normal. 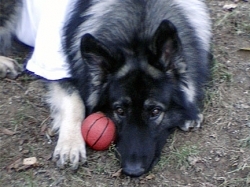 Although surgery was indicated, we chose to treat the condition homeopathetically and to date he remains an active dog, walking several miles per week in addition to backyard play and exercise, with no sign of a limp or pain. At the same time, we were concerned over a loss of weight and ran two TLI tests 30 days apart which yielded readings of 1.9 and .7. 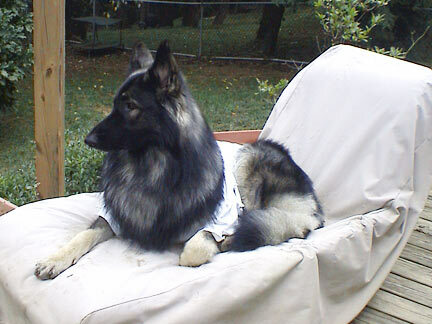 Readings below 2.5 indicate a diagnosis of EPI, a genetic pancreatic disorder. 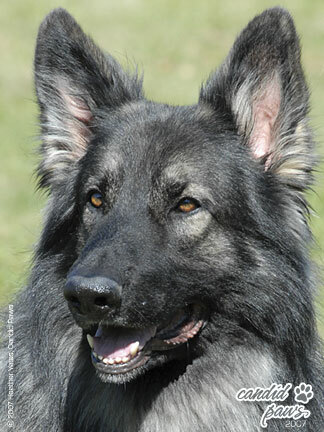 As a result of these diagnoses, and in line with our commitment as breeders to continuously improve the health of the Shiloh breed, Rommel has been formally retired from the Stardust breeding program and neutered. We regret that his size, type, and above all, his outstanding temperament will not pass to future generations. 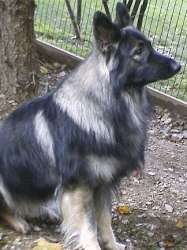 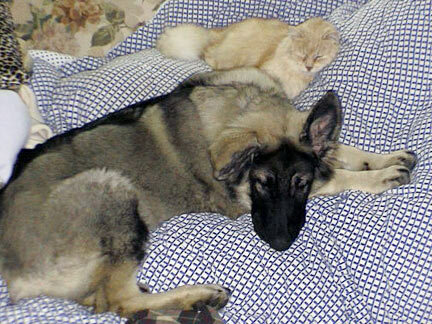 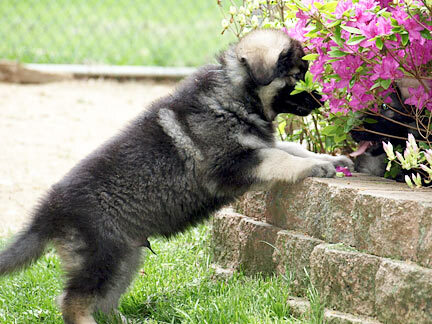 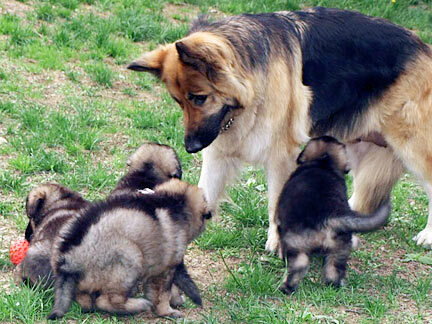 Rommel sired one litter prior to his diagnosis: the breeder was notified, and fortunately there is no indication that his progeny are symptomatic. 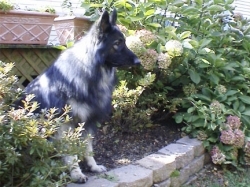 Rom’s diet is supplemented with enzymes, and he is doing well, having regained weight and to date showing no adverse effects. As is our practice with health testing on all our Shilohs, this information has been shared with the ISSDC community of breeders with whom we work. 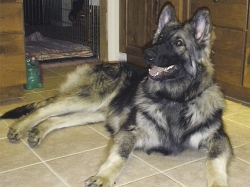 Rommel lives in retired bliss at Stardust, His favorite past times are lounging on the family room couch holding hands with Traci, and protecting the property against pesky critters, occasionally working as a Therapy Dog, as well as an all around ambassador for the breed. 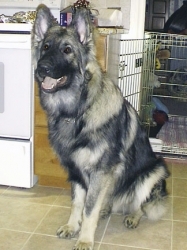 In June, 2008, he returned to the show ring after a 2 year absence and took Best Companion in Specialty at the NAKC/TSSR sponsored Shiloh Showdown in Lums Pond DE.